Proway Livestock Equipment designs and manufacturers cattleyards, sheepyards and livestock handling products that make livestock handling more efficient and safer for their clients. On 22nd January 2013, an employee of Proway Livestock Equipment’s Wagga Wagga manufacturing facility sustained burns to his lower extremities requiring skin grafts. A review of the companies WHS management System post the incident identified inadequate identification of hazards within the organisation, lack of risk reduction methods and minimal continuous improvement across WHS. As part of an Enforceable Undertaking entered into with WorkCover, Proway has taken significant steps to put in place the tools and resources to identify and control workplace hazards, train staff to utilises them and grow a workplace culture that encourages a consultative approach to WHS matters. Although Proway had a WHSMS in place at the time, the severity of the incident and the subsequent investigation identified many deficiencies that prevented the company from adequately satisfying its obligation to provide a safe workplace. As part of a site clean-up, it was decided that the lids would be cut off several drums for the purpose of utilising them to store timber and other random items commonly used within the workshop yard. Ten 44-gallon drums were sourced externally from a local supplier and provided unclean. There was no request to provide drums cleaned and suitable for mechanical / flame cutting. On the 22nd January 2013 the injured worker began cutting the lids off the drum without removing the bungs with a plasma arc cutting torch. The first 6 were cut without incident. As soon as heat was applied to the 7th drum, it exploded separating the base and propelling it 5.5 metres away. The labelling on the first 6 drums indicated they had previously contained hydraulic fluid. Upon investigation, it was revealed that the label on the last drum was obscured but testing confirmed it contained residual flammable amounts of degreaser. 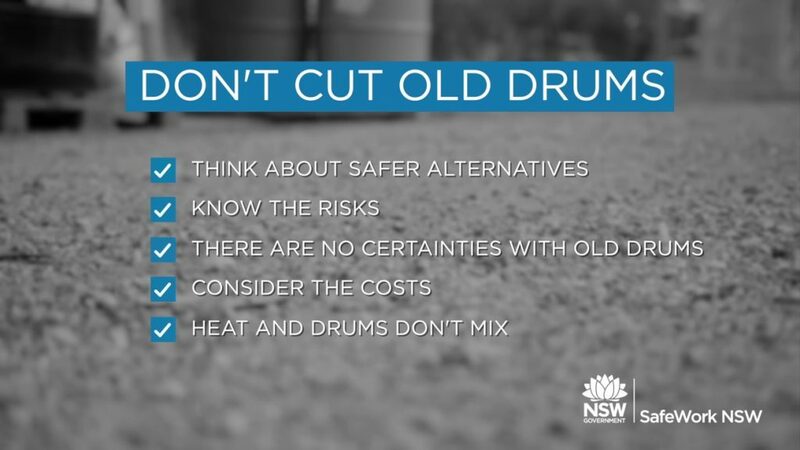 Cutting the tops off drums was not a routine task, had not been done before, and at the time of the incident there was no SWMS / procedure in place, or a reliable method of identifying hazards and risks associated with non-routine tasks. The Injured person suffered serious burns to 9% of his body and was rushed to Wagga Wagga Base Hospital and later airlifted to Sydney burns unit as he required skins grafts between his right knee and ankle. Follow up burns treatment occurred and fortunately the injured worker made a full recovery from the incident. How the cause of the incident was addressed? Proway accepted that the Work Health and Safety processes in place prior to the incident were inadequate and as a result had failed in our obligation to provide a safe workplace. An Enforceable Undertaking was entered into with SafeWork NSW on the 20th November 2015, and set out the steps required in order to satisfy our WHS obligations. All staff participated in a safety stand down where power point presentations informed them on the importance of changes to the existing WHSMS, their role in the new WHS system and how it improves safety and ultimately efficiency, and the consultation requirements and methodology. WHS Management System rewritten to reflect current requirements under WHS Act and Regulation, Australian Standards and Codes of Practices. Up until the incident we were experts at manufacturing sheep and cattle yards, but amateurs at identifying hazards in non-routine or irregular tasks. All the steps we have taken to rectify WHS systems in our workplace have identified that we need to stick to what we know best. So we have banned the practice of cutting any drum, vessel or tank on our site, we order in drums with removable lids when needed, and have taken significant steps to improve the WHS culture of the workplace. If we had undertaken a review of our WHS Management System sooner, we could have identified hazardous task or risky behaviours sooner and prevented the incident from occurring.